Table rare Arts and Crafts Oak hall lamp console c1900. 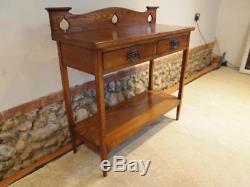 Here we have a fine quality Oak Arts and Crafts hall lamp or console table c1900. As you can see the table has great colour and patina. There is a wonderful gallery back with turreted ends and peirced decoration. There is a beautiful plank top with super grain and colour with two drawers below. The drawers retain their origional copper handles and have hand cut dovetail joints. The legs are tapered and joined by an undertier shlf also of good colour and grain. The photos make the table look a little orange but it is a lovely golden Oak colour throughout. A super period table of slim proportions ready for your home. The dimensions are approx 36 inches wide 14.5 deep and 35 high. The best price for this item is always direct from Cloverleaf Home Interiors. This item can be viewed at Cloverleaf Home Interiors where it can be collected from. Please take this into consideration when leaving feedback. Cloverleaf Home Interiors is a family run business providing excellent personal customer service. We operate from our 18th/19th century barn conversions in rural Norfolk. We have a friendly relaxed approach, which our frequently returning and new clients enjoy. Here at Cloverleaf Home Interiors we are committed to providing excellent customer service. Get images that make Supersized seem small. Tailor your auctions with Auctiva's. The item "Table rare Arts and Crafts Oak hall lamp console c1900" is in sale since Thursday, May 31, 2018. This item is in the category "Antiques\Antique Furniture\Tables\Victorian (1837-1901)". The seller is "cloverleafhomeinteriors2008" and is located in Attleborough.